ROSSENDALE VALLEY, England – A man working as a lecturer at Manchester Metropolitan University claims he has captured the images of the little flying humanoids, which he calls “fairies”. 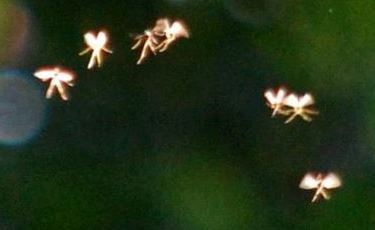 Credit: John Hyatt’s photograph of alleged fairies. “I went out afterwards and took pictures of flies and gnats and they just don’t look the same,” he told the Manchester Evening News. “People can decide for themselves what they are,” the professor, also a former Three Johns punk 80s band added. The pictures were taken in the Rossendale Valley, also known as the Forest of Rossendale, is home to the River Irwell and consists mostly of treeless moorland. Fairies are a heated subject in the Cryptozoology world and most researchers usually don’t bother to investigate. The Cottingley Fairies hoax in 1917, at a subscouncious level, could perhaps be behind this lack of trust in fairies today. Interestingly, Bigfoot hoaxes are quite prolific in the Cryptozoology field, yet the hairy cryptid keeps generating an abundant and enthusiastic interest among researchers. Other investigators have theorized that fairies could be part of an ancient type of hominid, similar to the wingless gnomes, leprechauns and the Hawaiian Menehune. It is not clear what Hyatt’s pictures really show; it could be an optical illusion caused by insects similar to the flying rods phenomena, although some claim this theory can’t explain the fast speed of the moving objects. Another plausible theory is that they are insects abiding by the Gestalt laws of grouping, based on the human mind natural disposition to perceive patterns in the stimulus according to certain rules. This could explain why the insects appear to have “little human legs and arms” on the controversial pictures. It seems that Hyatt is fully aware that human imagination is infinite, and encourages people to look at life with a positive attitude. The photographs will be exhibited at The Whitaker Museum in Whitaker Park, Rossendale. Mars Picture Shows Artificial Light, Intelligent Life? I’ve seen pictures of these before. They are a real mystery. It’s more than possible that these insectoids continue to grow to become the size of flying humanoids imo. I never thought of that. I guess if they are something other than regular insects then it is possible that could happen. The pictures are genuine and legitimate. What you are viewing in the photograph IS in fact, Real, Legit, Genuine “Fairies”. I know this, for sure, due to the fact that I, myself, have, had and continue to experience and witness True, real life Fairies. I see them regularly, I speak to and with Fairies on the regular, they seek me out and speak with me as well, regularly. I’ve developed a very unique, real, strong relationship with the small fairy people. Their “Interdimentional” beings. Their highly intellectual, resourceful, and very kind, gentle beings. They can vocally speak, but when I speak with them, it’s through the mind. So due to me being a world renown, Interdimensional Fairy being’s expert, I can say that this photograph is legitimate. Trust me. If ANYONE knows, it’s me. I’m an experienced, professional in the field of Fairies.